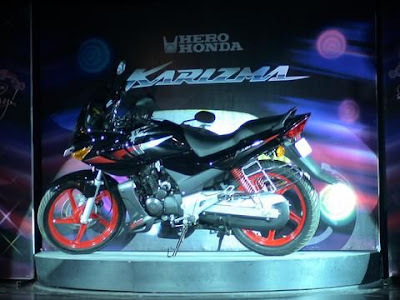 Hero Honda has re-launched its popular bike Hero Honda Karizma R in India, as per the pop up at the company website. The new bike comes with a lot alteration in appearance. The Hero Honda Karizma price in India has not been announced but expected to be added more. New Hero Honda Karizma R retains the same engine but its meter console, front fairing, graphics, engine cowl and side indicators have refreshed look. Hero Honda is also reported to launch a 400cc diesel bike in India. Popular bike models of the company are Hero Honda Splendor, Hero Honda Passion Pro, Hero Honda Glamour, Hero Honda Karizma ZMR.